The University of Kentucky is more of a basketball school, but soccer is the new buzzword at the hospital. With an anticipated 1 billion soccer fans around the world watching, a paraplegic Brazilian will signal the start of the 2014 World Cup on June 12 with a miraculous movement thanks to doctors around the nation and some from UK Hospital. Suited in a futuristic exoskeleton developed by researchers as part of the Walk Again Project, the young man will send a message from his brain to a robotically controlled leg, driving the first kick of the world’s most viewed sporting event. The paraplegic patient will also send a greater message of hope to people around the world who are limited by disabilities. The vision of Duke University researcher and principal investigator Miguel Nicolelis, the Walk Again Project is a research initiative aimed at developing brain-machine interface technology that will give paraplegic patients a way to regain mobility. Established five years ago, the consortium involves an international team of more than 150 neuroscientists, roboticists, computer scientists and rehabilitation professionals. One of those scientists, University of Kentucky associate professor Dr. Lumy Sawaki, will stand on the field waiting for an expression of joy on the ceremonial kicker’s face. For the past two years she has served as the lead clinician for the Walk Again Project, working closely with the kicker and seven other patients who participated in intensive modulation training to prepare for this 40-second “work-up” demonstration. For Sawaki, seeing her patients react to the sensation of walking again makes the extreme demands of the Walk Again project worthwhile. “They are my heroes,” Sawaki said of the eight complete spinal cord injury patients, who will all appear on the field during the work-up. Only one patient will be chosen by Sawaki and the Walk Again team on the day of the event to perform the ceremonial first kick. Sawaki, an associate professor of physical medicine and rehabilitation in the UK College of Medicine, and director of physical rehabilitation research at Cardinal Hill Hospital, has traveled to Brazil on a monthly basis since September to prepare for the work-up demonstration. At the beginning of her involvement, Sawaki was tasked with screening a group of paraplegic patients and narrowing the field of possible candidates for the work of up to eight individuals. In her role as the project’s clinical director, Sawaki has developed and implemented clinical protocols to ensure the eight patients are psychologically and physically fit for the training. Protocol includes performing clinical evaluations, checking for signs of osteoporosis and monitoring psychological well-being through a rigorous locomotor training process. The Brazilian patients travel to the research center three times a week for training. The Walk Again patients, all of whom have suffered spinal cord injuries, have lost their ability to send signals from the brain to the legs. Through an innovative technique called electroencephalography, or EEG, these patients side-step this neurological function by sending brain wave signals directly to a mechanical exoskeleton. Patients first engaged in a virtual environment where they were first trained to mobilize an avatar using EEG stimulation. Now, in preparations for the work-up demonstration, the patients are suiting up in the exoskeleton to take their first steps. 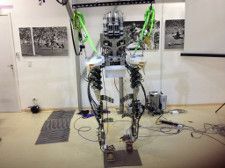 While the fanfare surrounding the “work-up” during the opening ceremonies of the World Cup bring international attention to the work of the Walk Again Project, Sawaki said the demonstration is just a beginning – a “kick start.” More work will be required to refine the robotic exoskeleton. She tells her patients that the research being conducted through the Walk Again consortium has real potential to change the lifestyle of debilitated people. Early in her career, Sawaki was drawn to rehabilitation because she felt a passion for improving the lives of severely affected neurological patients. She believes the integration of biotechnology will be a critical component of creating new opportunities in rehabilitation. The Walk Again Project’s clinical team and biomedical team collaborate constantly to ensure the safety of the patients and success of the work-up demonstration. A native Brazilian, Sawaki feels honored to return to her home country to show the world progress in rehabilitation technologies. She received her medical degree in Sao Paulo and a doctorate degree at Kobe University in Japan. She completed a three-year post-doctoral fellowship at the National Institutes of Health. 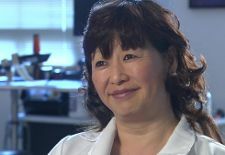 Prior to joining the UK Department of Physical Medicine and Rehabilitation and Cardinal Hill Hospital in 2008, Sawaki held a faculty position in the Department of Neurology at Wake Forest University. She said the University of Kentucky has supported her time commitment and frequent travel required as part of her role as clinical director for the Walk Again Project. She believes her involvement in the project will open up future opportunities for UK to be involved with breakthrough rehabilitation research on an international scale. The opening ceremonies of the World Cup kick off on June 12 at 3:15 p.m. in Brazil.